There is a lot of interest in growing orchids in “Semi-Hydroponics” or S/H. This technique was originated Ray Barkalow , who maintains a wonderful website with a great deal of information on both orchid culture in general and semi-hydro in particular. 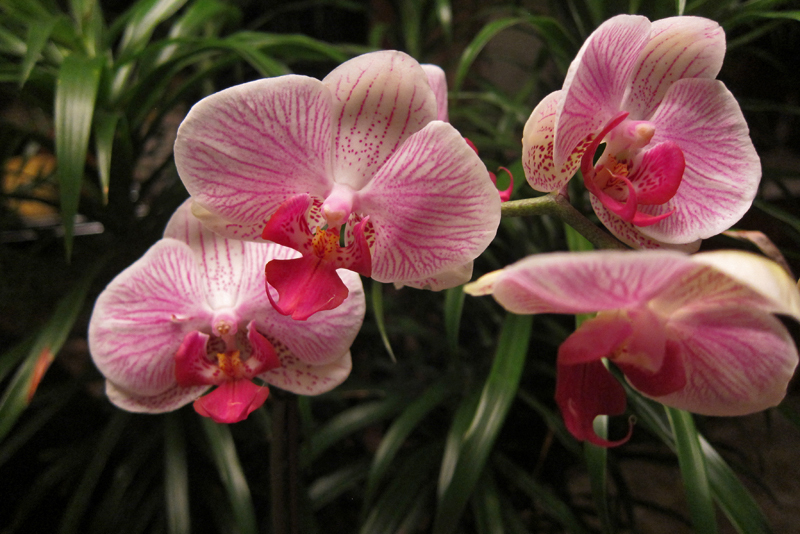 Most orchids can be grown in S/H – Ray has a list of those that he has currently under this culture. The method is based on the use of a porous, inert medium in a self-contained pot which allows the plant to pull water out of the medium as needed. The media is soaked at the time of watering and a reservoir of water remains at the bottom of the container and is wicked up through the media as the plant uses water. plants do not need to be repotted as often since they can be put in larger containers to begin with. This eliminates the broken roots and growth setbacks associated with repotting. roots are not subjected to breakdown of media and the media stays very porous which allows for wonderful root growth. The roots never get too much water either, so there is much less chance of rot. There are a number of different containers and media available for use. A number of vendors have special hydroponics pots made out of several different materials. For orchids you want a container with a reservoir at the bottom of approximately 1” which will allow for water to be wicked upward as the plant depletes upper layers. Above that point you need openings to completely drain out any water so roots are not subjected to water around their roots for too long. The most used media is a clay aggregate material in the coarse size in order to allow for the best air circulation. It is important to make sure that the medium you choose is reusable in order to make the economics more favorable. One of the most recommended clays is Prime Agra™. Watering is required much less often than in a traditional set up. Fertilizer is also reduced since the plants can use all the fertilizer that is provided to them rather than having it all run out the bottom of the pot. If you are interested in S/H, I recommend that you go to Ray’s website and join the S/H forum there. There is a lot of good information already there, and you can ask questions from experienced growers too. Content copyright © 2018 by Susan Taylor. All rights reserved. This content was written by Susan Taylor. If you wish to use this content in any manner, you need written permission. Contact Anu Dharmani for details. Join us in the forum and share your latest success with orchids. You can also join us to ask questions you may have on growing orchids. Subscribe for free weekly updates from this Orchids site.